In the state of Michigan, getting a traffic ticket means getting points added to your driving record and that means dollars added to your insurance premiums. Thankfully, the state allows drivers to complete a Michigan Basic Driver Improvement Course (BDIC) to keep those points off of their records. The easiest way to get that taken care of? With our online defensive driving course. 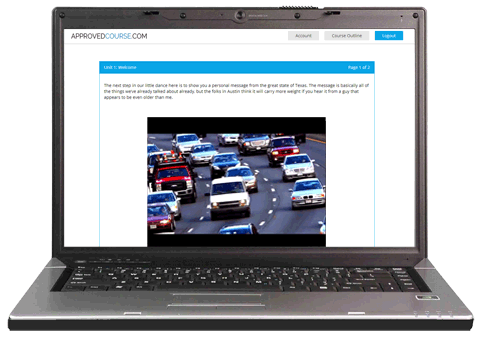 Why Take Michigan Defensive Driving Online? Taking the Michigan BDIC Program online gives you the power to complete the course whenever you want, wherever you want. You don’t have to figure out where the classes are held, find transportation to that classroom and then look for a chunk of your schedule to give up to sit in that classroom. If you have access to the internet, then your computer, tablet or smartphone becomes your classroom. Work whenever you want, whenever you want. You’ll find a review quiz at the end of each chapter and a multiple-choice final exam. The state does require a score 80% or better to pass, but not to worry. While we are confident our course will prepare you to pass the first time, our unlimited retake policy will make sure that you will! Drivers who complete our Michigan Online BDIC Program may qualify for a reduction in insurance premiums. Eligibility can vary between providers, so check with your agent for full details. Lowering your insurance rates couldn’t be easier. Just send a copy of your certificate of course completion to your insurance company as soon as you have finished the course! In fact, pretty much nothing. Unlike many other states, the state of Michigan allows us to handle all of the paperwork and red tape for you. Once you finish your final exam, your certificate of completion is processed and reported directly to the Secretary of State’s office. No more waiting by the mailbox or running to the post office to make sure you meet your ticket dismissal deadline. Of course, we send a copy of your course completion to you, too, and offer several quick and affordable delivery options depending on how fast you need it. Again, it could be that your copy will lower your insurance rates so call your insurance guy to see. It doesn’t matter if you are taking our course in the middle of the day or the middle of the night, if you have questions, we’re here for you. Our customer support team is available to take your phone call or email 24 hours a day, 7 days a week. Whether it’s a question about the Michigan BDIC Program, how traffic ticket dismissal works, or even just a general question about Michigan traffic law, we’re glad to help. That depends on why you need to take a driver improvement course. Are you looking to dismiss a ticket? Save money on your car insurance? Brush up on your driving skills? The good news is that if you are hoping to accomplish any (or all) of these things, then this is the course for you. The course we offer is fully approved by the Michigan Secretary of State, so you can't go wrong. Click REGISTER and get started today!